Hello foodies! Summer is over :(, Fall sped by here in MN, and it’s officially Winter here. Can’t believe it will be Thanksgiving later this week! Many of you must be frantically preparing for Thanksgiving cooking and family visiting. I wanted to share with you a simple, healthy and light recipe to serve either as a side during your Thanksgiving meal, or as a tummy-friendly meal by itself, for the night after eating, drinking and midnight shopping. (I know I’ll do that last bit with much gusto this year). I recently came across this easy recipe when I was wandering the internets (yes, I said internets.) and stumbled across this amazing blog called Lisa’s Dinnertime Dish. I made some edits to the recipe to make it a little more spicy, tangy, and creamy – I added some chili powder and some lemon juice to suit my tastes. 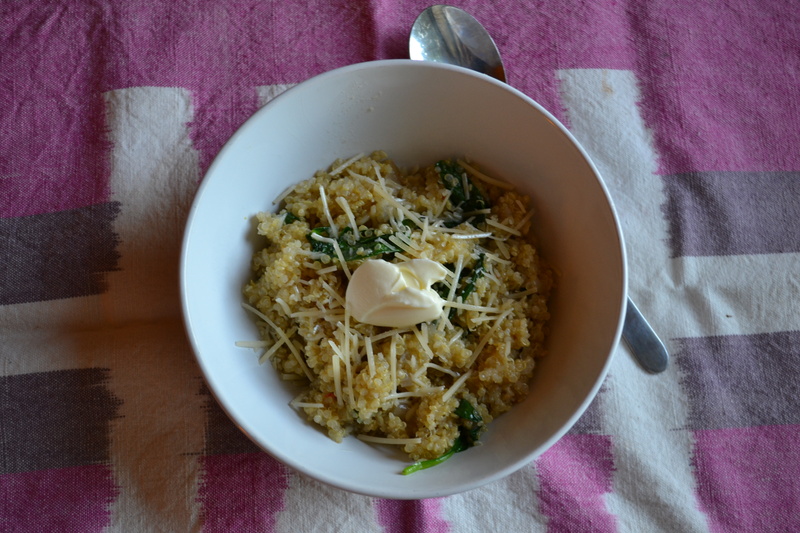 Because I like my quinoa a little creamier, and instead of adding more cheese, I cooked the grain with a mixture of chicken stock and 2% milk.What I also love about this recipe is that it is a perfect meal for one person. 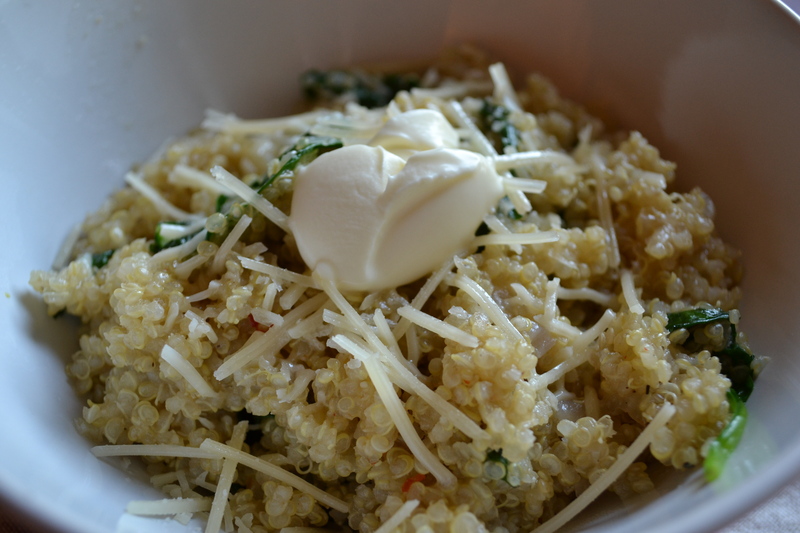 1 cup of quinoa is perfect for dinner tonight, and a work lunch box tomorrow. I encourage you to please check out Lisa’s recipe and follow her recipe as is. Hope you like it as much as I did! 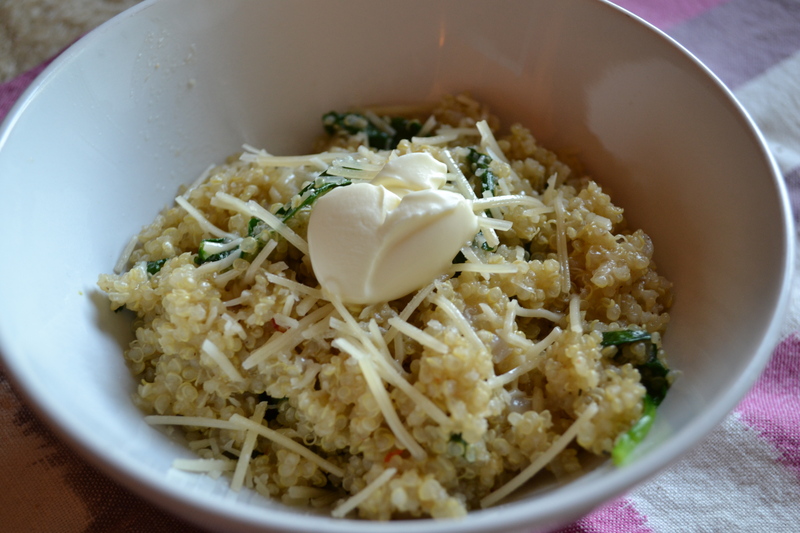 Thanks for sharing my spinach parmesan quinoa with your readers! The changes that you made to the recipe sound delicious. I had never thought of adding milk to make it creamier, what a great idea. I love Indian food but have never really made it at home. I’m looking forward to looking through your site to find some recipes to try!